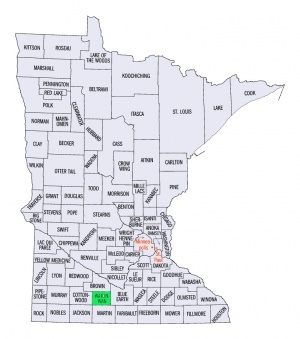 Watonwan County is located in the southern part of Minnesota. It is the fourth county east of the South Dakota line in the second tier of counties above the Iowa border. Most of the Mennonites are found in the western and northwestern parts of the county. Four hundred Mennonites, members of seven congregations, five of which are, however, centered in Cottonwood County, live in Watonwan County. The Mennonite settlement extends solidly westward into Cottonwood County, with a few living in surrounding counties. There are 403 General Conference Mennonite (GCM), seven Evangelical Mennonite Brethren (EMB), and four Mennonite Brethren (MB) members living in Watonwan County. The first Russian Mennonites in the county settled in Butterfield Township in 1875; the first Galician Mennonites came in 1881. The two Mennonite churches in Watonwan County are the Mennonite Church (GCM) of Butterfield and the First Mennonite Church (GCM) north of Butterfield. There are no other Mennonite institutions in the county. Linscheid, Willis. "Watonwan County (Minnesota, USA)." Global Anabaptist Mennonite Encyclopedia Online. 1959. Web. 24 Apr 2019. http://gameo.org/index.php?title=Watonwan_County_(Minnesota,_USA)&oldid=93871. Linscheid, Willis. (1959). Watonwan County (Minnesota, USA). Global Anabaptist Mennonite Encyclopedia Online. Retrieved 24 April 2019, from http://gameo.org/index.php?title=Watonwan_County_(Minnesota,_USA)&oldid=93871. Adapted by permission of Herald Press, Harrisonburg, Virginia, from Mennonite Encyclopedia, Vol. 4, p. 899, 1148. All rights reserved. This page was last modified on 23 August 2013, at 14:24.